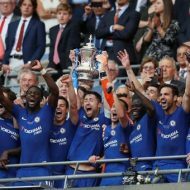 Defending champions Chelsea will host Manchester United in the fifth round of the FA Cup after the draws were conducted Monday night. United defeated Arsenal in the fourth round last week to record an eighth straight victory under caretaker boss Ole Gunnar Solskjaer but face another tough tie against Maurizio Sarri’s Chelsea. Welsh club Newport County, who are 14th in League Two, forced a replay at home to Middlesbrough after scoring an injury-time equaliser in a 1-1 draw at the Riverside over the weekend. Newport beat Premier League opponents Leicester in round three and could book a clash with Manchester City if they upset Boro in next week’s replay. Crystal Palace were handed a trip to Doncaster and Watford away to Portsmouth or QPR, while Wolves and Brighton face fourth-round replays.